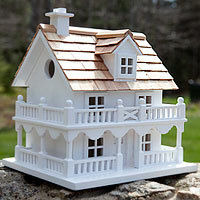 Our Architectural Birdhouse is handcrafted of kiln-dried hardwood, exterior grade ply-board and western red cedar or pine shingles for the roof. The finish is a non-toxic, oil-based paint. Our birdhouse is intended for use with wildlife and, therefore, no pressure-treated wood or harmful chemicals have been applied. The cedar shingles will naturally patina to a silvery gray color with sun bleaching. Structure is built with aeration slats for good air circulation. Solid wood with resin detail. Wooden display table. Made in China. Semi-gloss finish. Fig species which is native to South and Southeastern Asia. These evergreen trees are particularly good for bonsai training, as they produce sturdy trunks, good branching characteristics and shiny leaves. Great for indoors year round. The brighter the location, the more compact the growth. Three tree forest group, easy maintenance. Flowering crabapples are one of the best flowering trees for bonsai. They produce beautiful white, fragrant flowers covering the entire tree in early spring before the foliage appears. The foliage is really small and lobed. Little green pomes (apples) appear in summer, derived from the enlargement of the entire flower receptacle which becomes fleshy. The fruit ripens to all different colors in the fall when the foliage begins to turn to shades of yellow, orange and red. Winter brings a nice twiggy skeletal outline punctuated by the fruit which persists throughout the winter. They are easy to grow and quite pest and disease resistant. Deciduous. Keep outdoors. Available 12 months a year. Will have no foliage during winter months. Fig species which is native to south and south-east asia. This evergreen tree is particularly good for bonsai training as they produce sturdy trunks, good branching characteristics and shiny leaves that remain on the branches much better than other ficus varieties. Three tree forest group. Easy care and great for indoors.